PSG superstar Kylian Mbappe had quite an eventful game against Nantes this evening, after an earlier dive the ace scored a penalty but then missed a retake. The Parisians were awarded a penalty after Presnel Kimpembe’s header was handled by a Nantes defender. Mbappe stepped up to take the spot-kick and looked ice-cold as he sent the goalkeeper the wrong way – unfortunately Mbappe’s excitement was cut short. 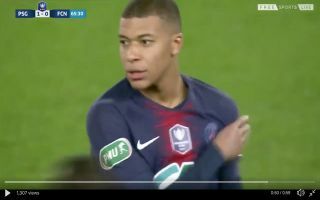 The referee ordered for the penalty to be retaken after players from both sides encroached the box before Mbappe struck the ball. This time Mbappe decided to slot his penalty into the opposite direction and the keeper’s gamble to dive the same way, paid off. Mbappe got his own back in the 85th minute by scoring a penalty to extend PSG’s lead to two goals. Referee calls for it to be retaken ? I don’t think Mbappe would’ve thought that tonight’s French Cup tie would be eventful, the World Cup winner was the centre of the attention.